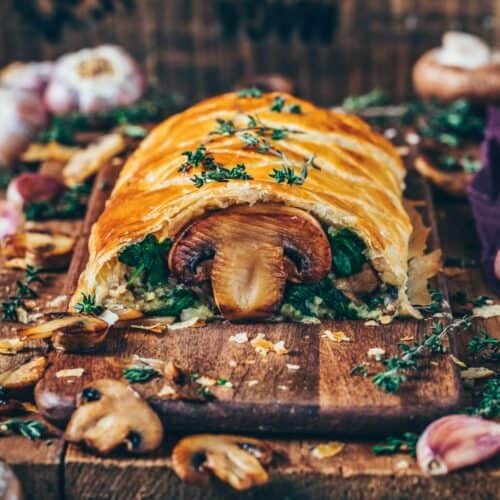 This vegan mushroom Wellington makes a great meatless vegan roast recipe, and it will definitely get the non vegans interested too! It’s very easy to make, hearty, flavorful and so delicious! Christmas is getting closer, and there have been so many of you asking for a simple but delicious Christmas recipe for a vegan roast. Well, here it is! 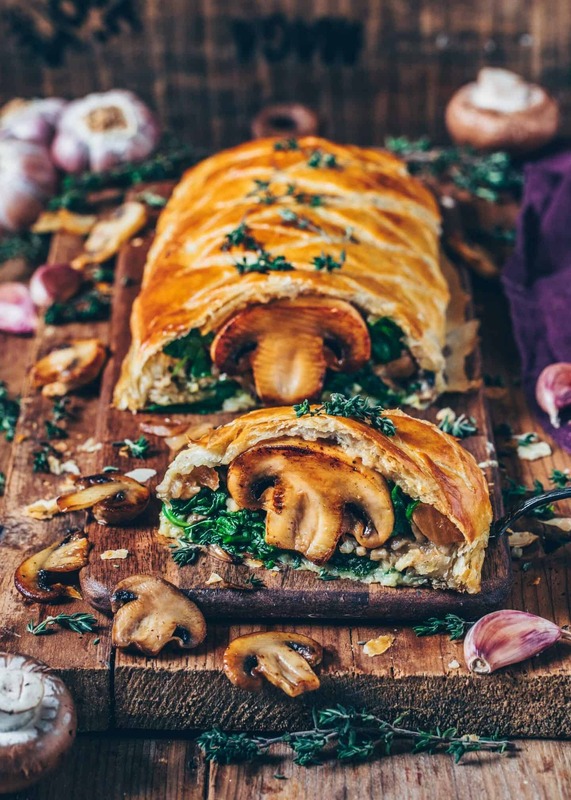 This vegan Mushroom Wellington recipe is one of my absolute favorite Christmas recipes, and meat eaters love it too. I’ve already made it so often and with different add-ins, and it has always turned out so good! 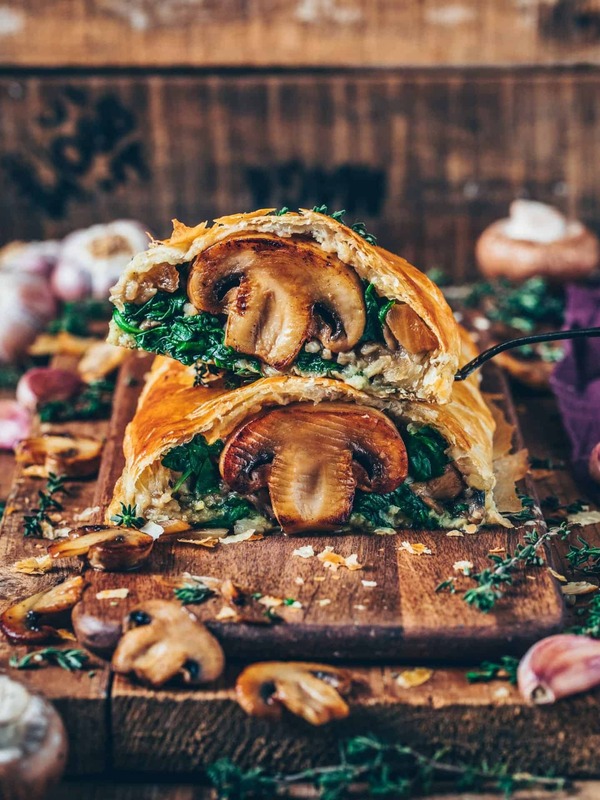 It is wrapped in a thin flaky pastry, and filled with mostly Garlic Mushrooms. 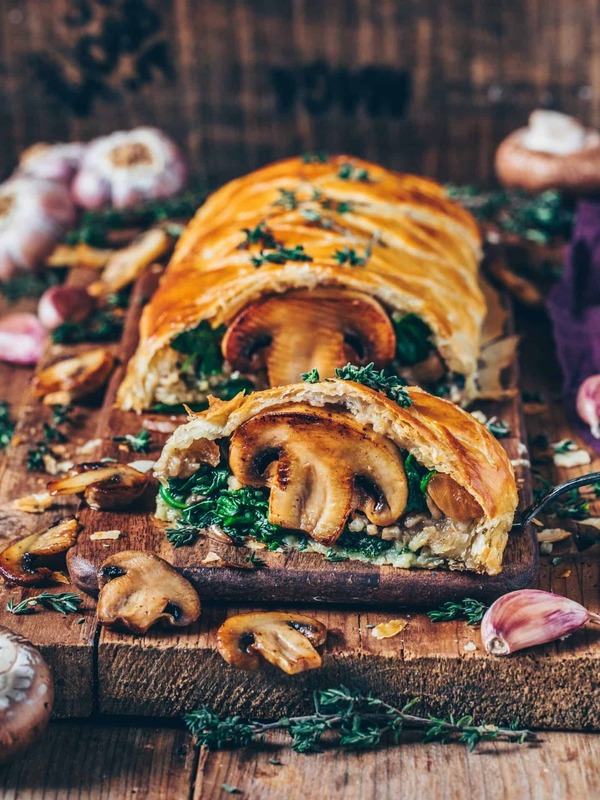 I‘m pretty sure you’ll love this Mushroom Wellington too, moreover, it’s also so versatile to make. There are only three necessary main ingredients required for the filling. 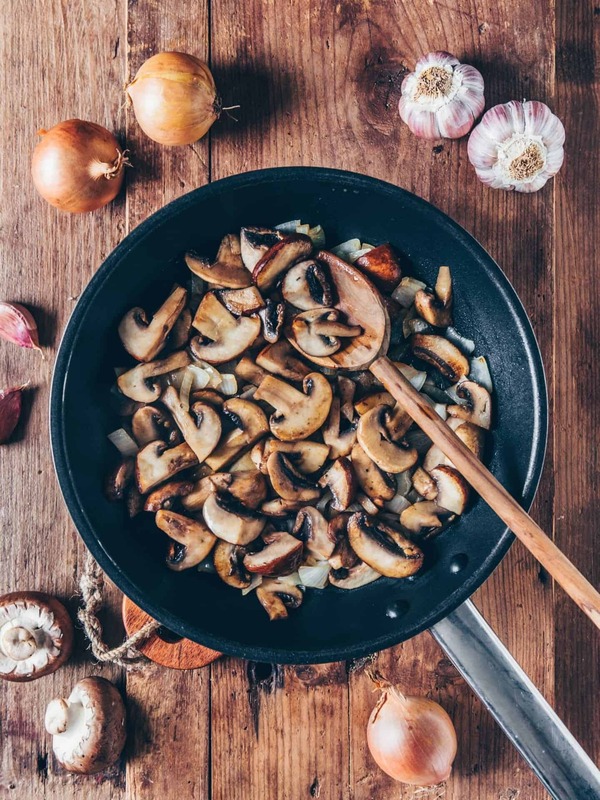 First are the mushrooms as the meat alternative (because they have such a great meaty texture), second and thirdly are the caramelized onions and roasted garlic which add amazing flavors. The additional ingredients are up to you. I also like to add some walnuts or pecans, spinach and rice for more volume and a better texture. Furthermore I have figured out that it’s very delicious to add some dairy-free shredded cheese or vegan parmesan. Anyways, that’s just my personal opinion, so feel free to add the ingredients you like! You can of course also add other healthy vegetables, such as peas, beans and lentils that are also rich in protein. 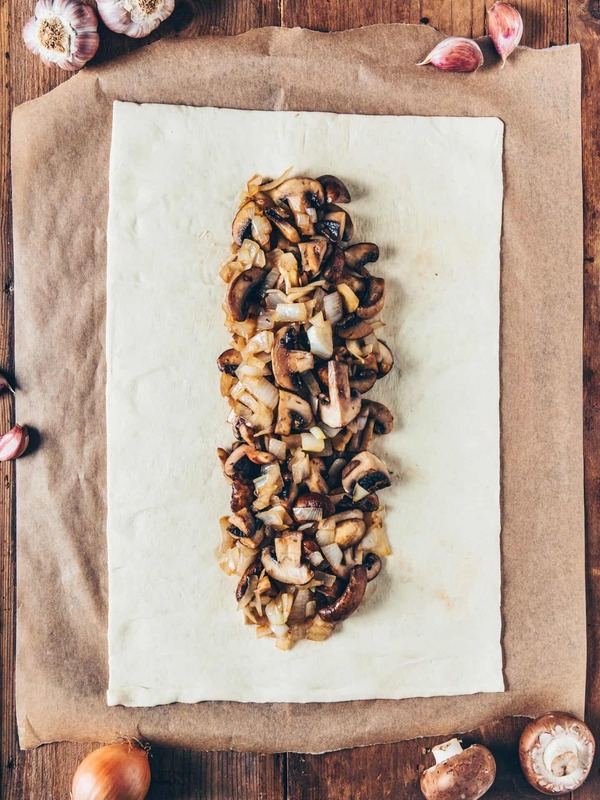 If you decide to go with the easiest way and want to add only mushrooms as a filling for this vegan roast, simply follow these easy steps. 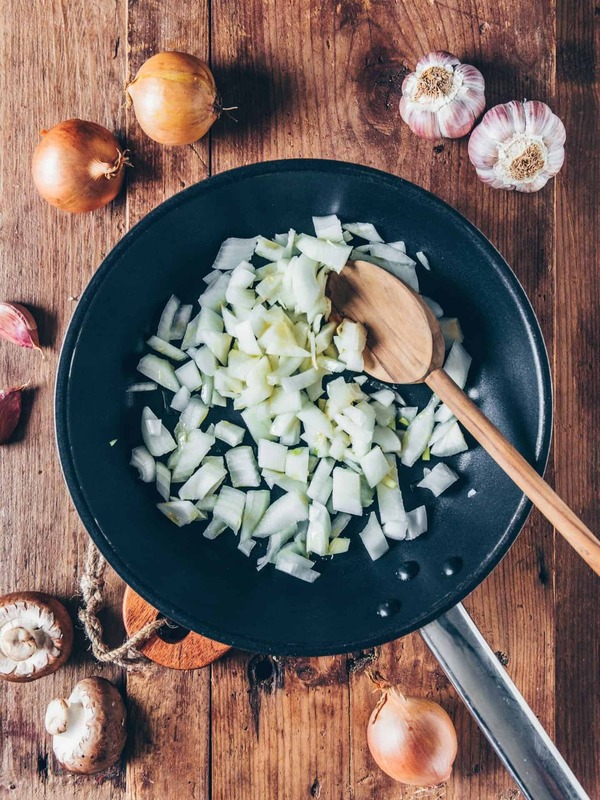 Start with frying the onions, then add the mushrooms and seasonings, and continue cooking for a few minutes. They should be lightly browned but not cooked through, because we don’t want them to loose all their liquid. 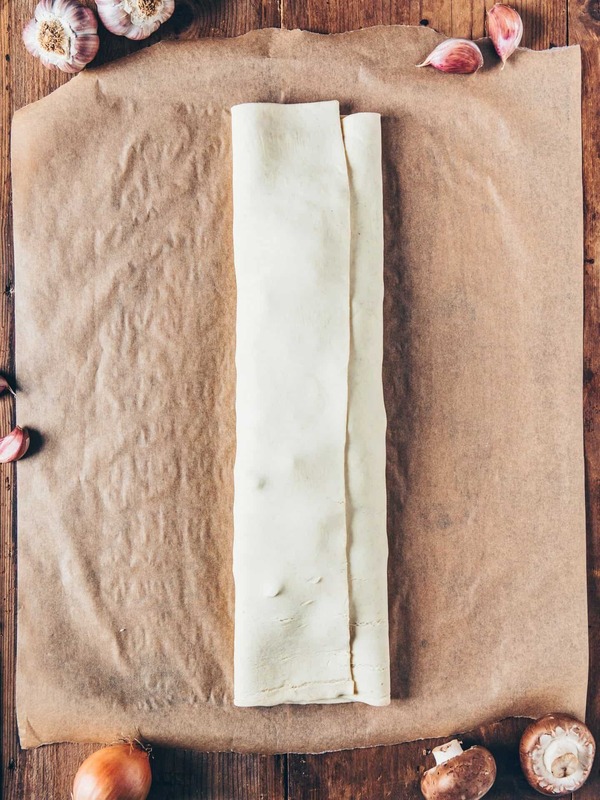 After preparing the filling it’s very important to pat everything dry, and make sure it is completely cold before wrapping it in your vegan puff pastry. 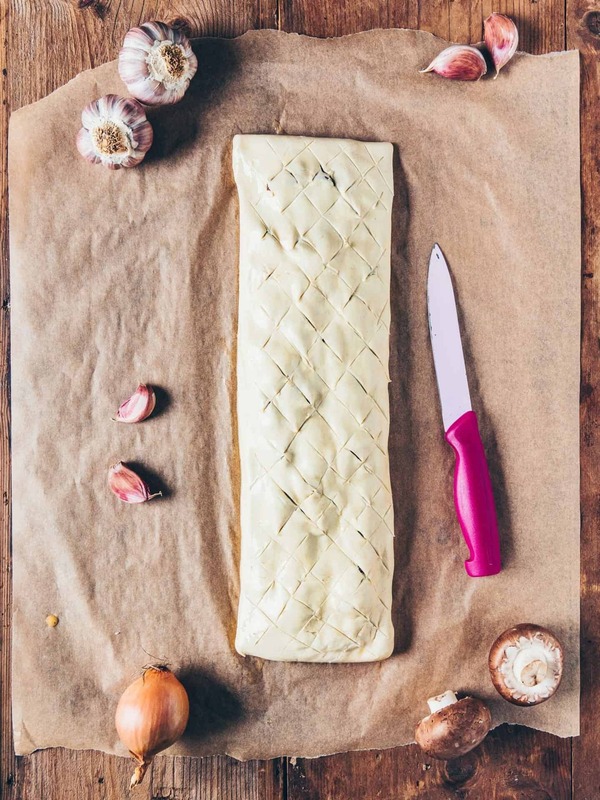 Otherwise the pastry is going to get soggy and will tear when you want to wrap up your mushroom wellington. Once the filling is cool, spread the onion garlic mushrooms over the middle of the pastry. Then carefully wrap to form a loaf. Press down to seal the edges. Roll over the loaf so that the seams are on the bottom. Gently cut slits with a sharp knife but don’t cut all the way through. Then brush with a little plant-based milk and bake for 20-25 minutes until golden browned and puffed up. 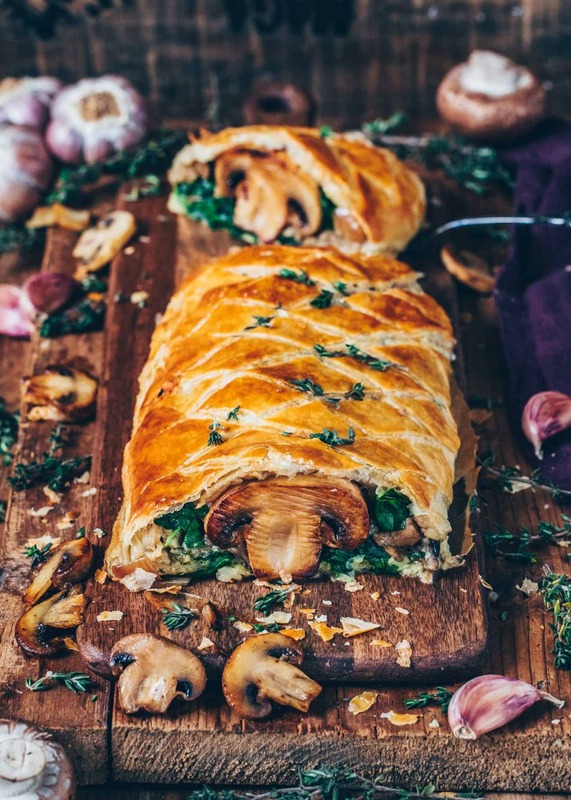 Make your Mushroom Wellington more impressive! 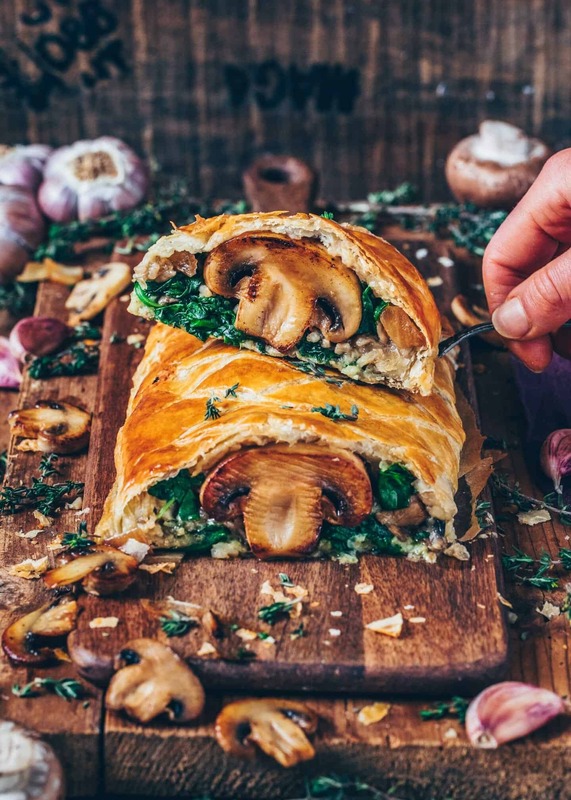 If you want to make your vegan Mushroom Wellington look more exciting, you can place 3-4 large mushrooms (such as portobello mushrooms) in the center on a bed of spinach, before adding the basic mushroom filling mixture around it. 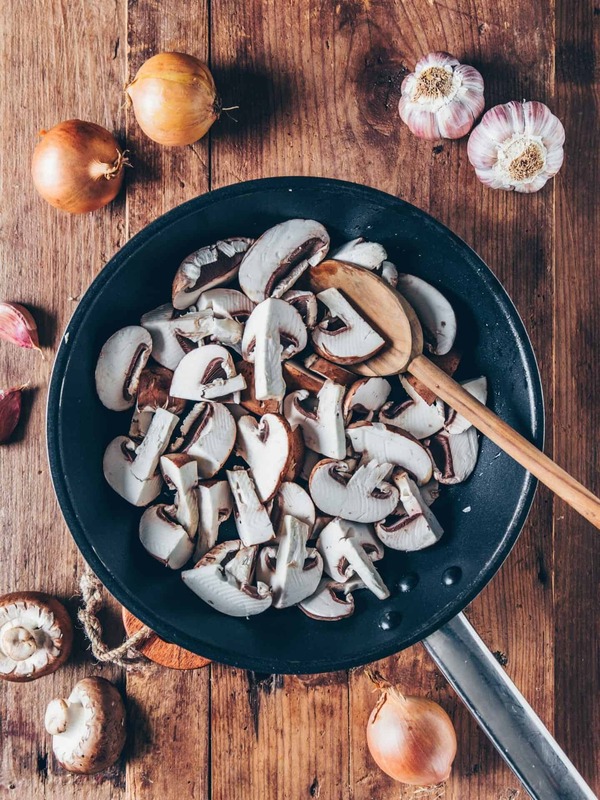 Once you serve and cut this vegan roast, these large Mushrooms will making a star appearance that’ll impress your guests for sure. 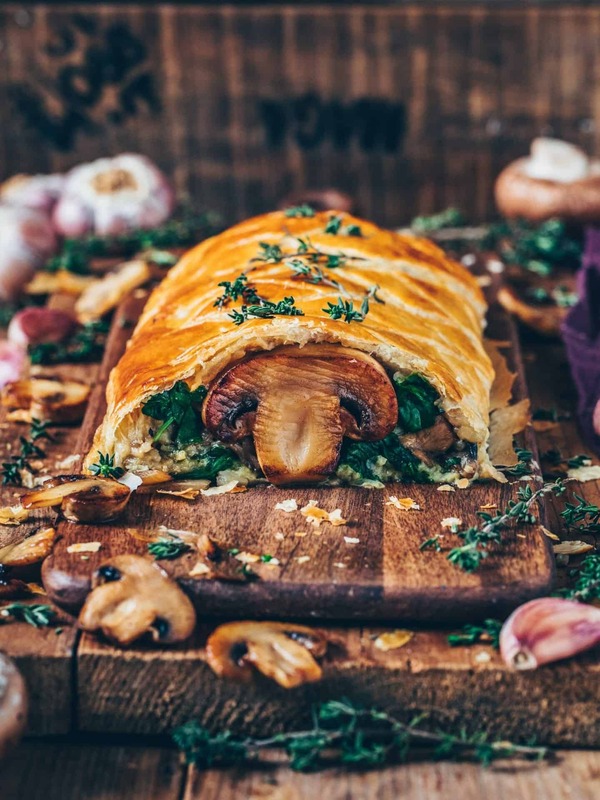 This vegan mushroom Wellington makes a great meatless roast for Christmas and it will definitely get the non vegans interested too! It’s very easy to make, hearty, flavorful and so delicious! Chop the mushrooms. (Optionally, reserve 3-4 large mushrooms to place in the center). Heat 1 tbsp oil in a large frying pan. Add the onions and fry until lightly browned, about 3 minutes. Add the mushrooms, season with salt and pepper and fry until lightly golden, about 5 minutes. Then lift the mushrooms out onto kitchen paper to drain. Place the pan back on the heat with the rest of the oil. Roast the garlic for a few seconds, add the spinach and cook for 2-3 minutes until wilted. Then place the spinach into a large sieve to drain and squeeze thoroughly. (Or simply thaw frozen spinach, and squeeze). 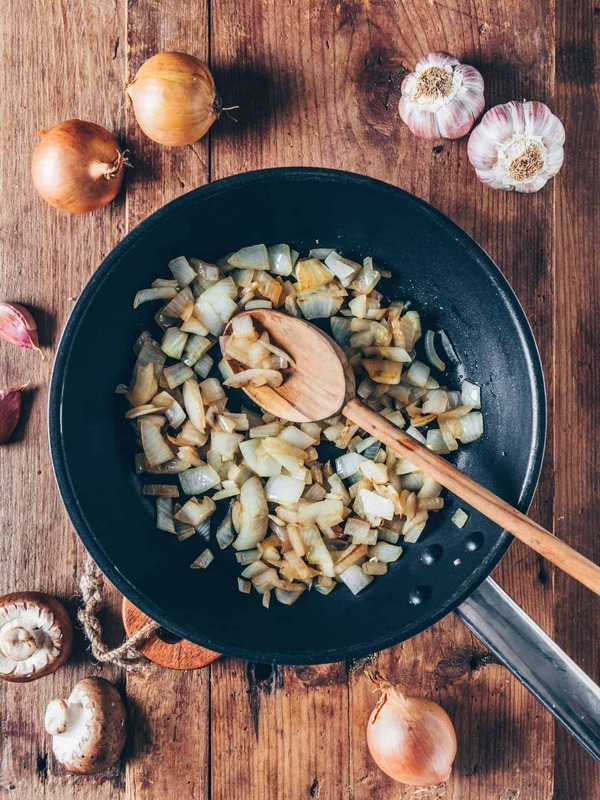 Combine fried mushrooms and onions with the cooked rice, season again to taste, add mustard (and optionally chopped walnuts and vegan cheese), stir to combine and place this mixture and the spinach in the refrigerator to cool completely. 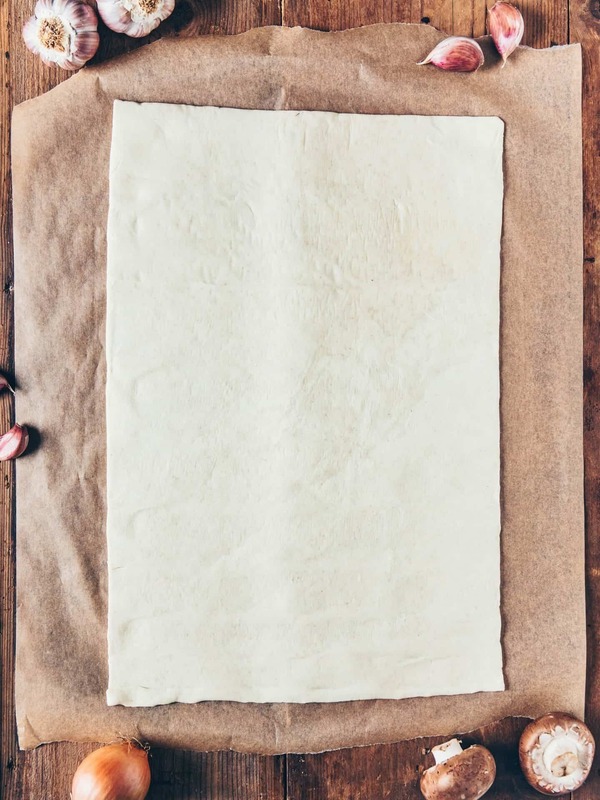 Place the puff pastry sheet on a baking tray lined with parchment paper. Spread the spinach over the middle of the pastry, making sure to leave a border at the edges. Place the mushrooms on top of the spinach. Top with the remaining filling and thyme, and press a bit together. 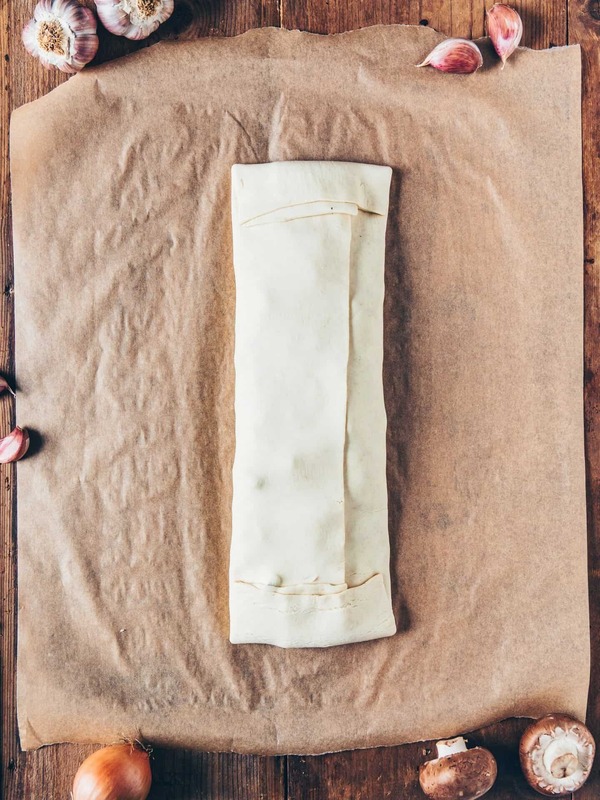 Carefully roll the pastry over the top of the filling so you have a loaf. Press down to seal the edges. Roll over the loaf so that the seams are on the bottom. Gently cut little slits using a sharp knife (but do not cut all the way through) and brush with a little plant-based milk. 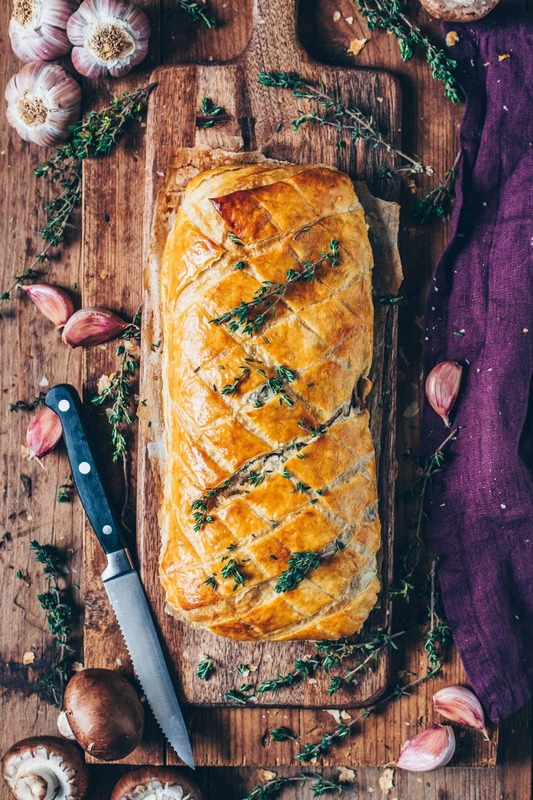 Bake the Wellington for approx. 20 minutes, until golden, puffed and flaky. This Wellington tastes best when baked and served immediately. Anyways, if you have any leftovers, you can bake and reheat it the next day in a preheated oven for approx. 10 minutes. It’s a versatile recipe, so you can add additional ingredients to your wish (if there's enough room). But please make sure that the filling is dry enough and completely cold before wrapping it in the vegan puff pastry. 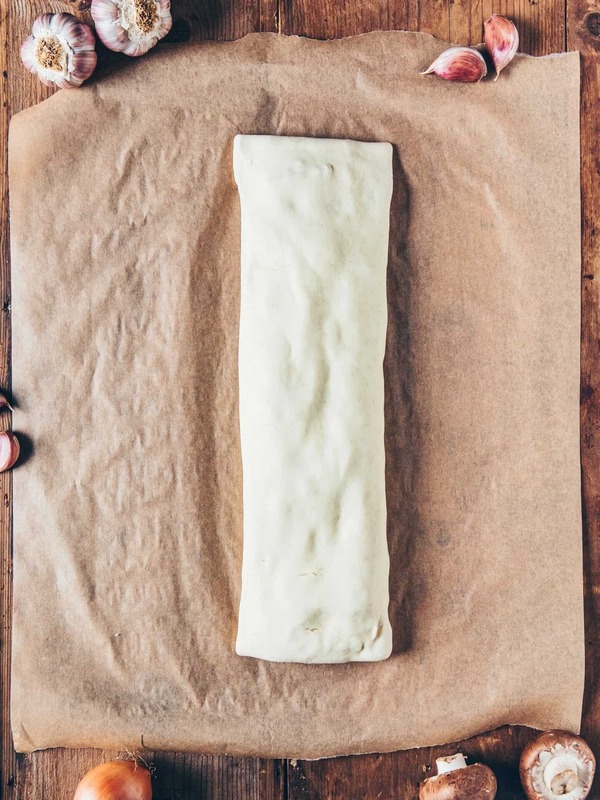 Otherwise the pastry is going to get soggy and will tear when you want to wrap up your wellington. If the filling is still too moist, simply add 2-3 tablespoons of oats or ground flaxseeds that will soak the excess moisture. 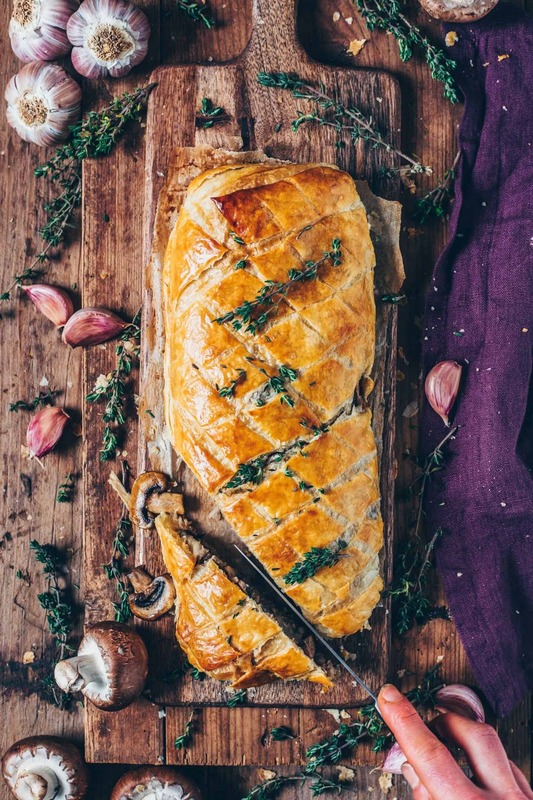 This Mushroom Wellington looks absolutely stunning. I am in love with the photos and I am sure this dish tastes amazing. It’s perfect for Christmas! I am planning on making this for christmas eve dinner. But was wondering if its possible to make the filling before hand, and leave it in the fridge overnight, they assemble, and bake the next day? Of course you can make the filling ahead. Have fun trying and enjoy your Christmas time. I made two of these for our christmas eve gathering. My family really liked it, even the vegan skeptics. They nearly finished them all. lol! It was delicious to me too! I added in lentils, and highly recommend. I even did the fancy mushroom thing and it was indeed impressive! I made it and it’s SO delicious. I want to try much more variations of this. It’s so easy and – Last but not least- very pretty! Thank you so much for the inspiration! Wishing you cozy Christmas days. 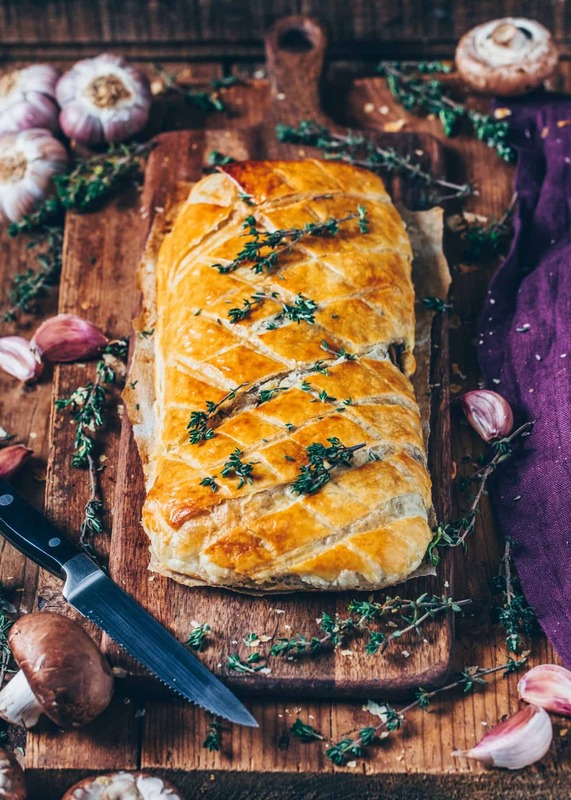 This post inspired my husband and I to make Wellington for Christmas dinner. We made the stuffing the day before using onion, mushrooms, celery and carrots. We added a rice & lentil mixture along with pine nuts. We “herbed” it up a bit with some fresh Rosemary and Thyme and a sprinkle of Poultry Seasoning at the end. Most important is the recommendation for the filling to be dry. We gently cooked the veggies down until there was not much moisture. The lentil and rice mixture was aired out so it was nice and light. It was spectacular with mushroom gravy. This sounds amazing! I’m so happy that you liked this Wellington so much. I tried this recipe for my vegan Christmas and it was a real success. The result is amazing and at the same time easy to make. I also appreciated the fact that you do not have to spend hours in the kitchen to get such a beautiful and tasty result. If you want to please your guests and impress them go for it.